I freeze in the winter. But the cold air is so much easy to breathe and the sunlight is crisper than in summer, somehow. First up, the Sewaholic Renfrew. I must be the last person in the sewing world to make up this pattern. As it turns out, I really like it. I didn’t at first try-on. I thought it was shapeless and completely unflattering. But it has grown on me. It’s comfortable and has a lot of room in its rather straight cut, and that is just perfect for me these days. This is a beautiful rusty orange. Oh! Before I forget, remember those made-a-few-years-ago-worn-almost-every-day brown jeans I mentioned in my Jalie jeans post? Well, they feature in all these photos despite their front fitting issues. I made no changes to the pattern other than making the back in a double layer of the jersey, as it is rather lightweight. It washes and dries beautifully, too, although the Tencel in it tends to make it a bit prone to wrinkling. The next pattern was Burda 6838 I love draped tops. This replaces an old RTW version that got worn and washed so much it started to look ratty. I made no changes whatsoever to this pattern. WYSIWYG straight out of the envelope. Surprising. Next up: Burda 11/2014 #114 in a lighter brown. I love the back yoke with the integrated draped front. I made two changes: shortened the sleeve and, instead of doing an FBA, I lowered the attachment points of the drape at the side seams by 8cm so they fell under my bust instead of above it. And I left all the edges raw. The sleeves on this needed to be shortened by a whopping 8cm. Seriously. I’m not 100% in love with this. 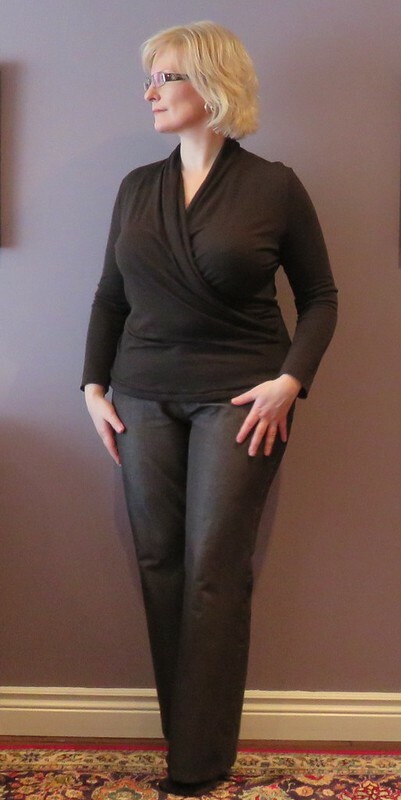 The dropped shoulders aren’t particularly flattering, and it could be taken in a little through the waist/hips, but I’m shying away from snug-fitting clothing these days. And I think shortening it about 2cm would be a good plan. This is my second BurdaPlus knit top pattern, and as flattering as they are in pictures, they are not fun or easy to wear. It’s a very flattering look through the shoulders – which is probably the point in a plus-sized garment… drawing the eyes up and away from the goods… but keeping those shoulders in place is a nightmare. I ended up running elastic through the neckline to the CB and CF points to snug it up a bit and stitching layers together the below the centre points to keep the shoulders from sliding off, and the CF and CB settling into a lower meeting place. Of course this is just lazy non-fitting, but after seeing this in photos, I’m not crazy about the use of the different browns, anyways. And it’s not very warm, which was the point of the wool jersey, precisely because the neckline is so wide and open. So, like this earlier BurdaPlus make, it’s been donated. Lovely! The Burda crossover top from the mag – I think it did have amazingly long sleeves; if it’s the one I am thinking of. The model had them pushed up a bit. I like the envelope one a bit better anyway though, although I can’t quite work out what the difference is. What a pity the two colour top wasn’t comfortable. It looks great on you but there’s no point shivering. I prefer the envelope one, too, and I think it’s the shoulder placement. Dropped shoulders are not always flattering. What a lucky find… all those fabrics! They are all nice tops. I can understand how sometimes a garment doesn’t quite come out to our liking. When that happens to me I pass it on to a charity too. Oh and forgot to add that the tops look lovely. Which Fabricland has wool tencel jersey? Somehow I think you’re in the GTA like me. I’ve seen bolts at the Vaughan location – which is moving in May and everything is discounted at least 30% – and the Dundas/Hwy 427 location. More colours available in Vaughan. Have fun shopping!! Nice work. What a shame that bi colour top wasn’t good to wear. It looks fabulous on. I think it would work if I tweaked the fit through the shoulders. The wide neckline IS rather flattering. Kind of envious as you look so good in all of these and I am sewing a dud right now!! Love the first chocolate draped/wrap top. So flattering. Nice job, as always.